These are the lightest, strongest and most advanced handcuff design available. Design input came from the field from officers and instructors in over 100 countries where ASP conducts training. These Ultra Cuff handcuffs have every available feature to lighten the load of the officer or agent while providing the most secure restraint possible. 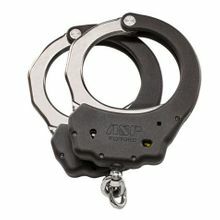 These superb handcuffs made from either steel or ordnance grad 7075 T6 aluminum alloy are designed to make the "rock and lock" method of restraint application quicker and more certain. The bow hinge is sturdier making the movement of the cuff to lock more reliable. The frame is assembled using heat treated 4140 spiral groove locking pins. The locksets double lock from the key level. Access to the lock set is available from both sides. Lock sets are replaceable. Each cuff is finished with Type III military grade hardcoat anodizing. The finish is as hard as a knife blade. Most departments are transitioning to these models from their old cuffs. ASP keys and cases fit all Ultra cuff restraints.